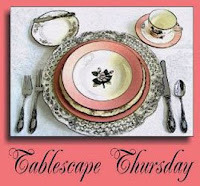 Susan @ Between Naps on the Porch has invited us back for another Tablescape Thursday. If you would like to join in take some photos of your table setting whether over the top set for the Queen or simple with a picnic flair. It doesn't matter. Just join in by adding your url to the Mr. Linky thingamabob on Susan's page after you publish your post. Make sure to visit the other people who have joined in. Now for my Sunday dinner with friends. We were not sure of the weather for this day. Our sunshine had disappeared and the winds were picking up. Finally about half an hour before they arrived I decided to take a chance on the weather and I set the table. We don't get the hot sun back there anymore since the trees have grown so big. Not that it was sunny that day. Of course Maxine is right there hoping for a place setting of her own. It is funny how the wine glasses have disappeared in the photo. I should have poured some red to help them show up. I have started to use tea towels as napkins as they are much bigger and stay on the lap easier. They are soft and very washable too. Not to mention they can soak up a whole lotta dribbles. My dripless candles were apparently not cooperating. We also had to relight them a couple of times when the ice cold wind blew in. Us ladies were wrapped in afghans shortly after dinner. We finally gave up the challenge and went inside to enjoy dessert. Very pretty! I love your deck, too. I love this!! It is more of a backyardscape than tablescape. I've never heard you mention that beautiful veggie garden! And your lovely deck! I want to know what kind of flowers were in the pitcher on the table...I haven't seen them before. The tablescape is pretty. Sorry about the candles. That must have been a bummer cleaning up that pretty candelabra. You know, we can sit out night after night but when we have company, it's either too hot, too cold or the bugs invade. Such is life. Yes the deck...I have recently spent a week staining it. Two decks actually as there is one up top too. Will have to do a met Monday with the pictures. Jane: those flowers are imported from some far away land where they grow in a factory with underpaid labor putting them together. So sorry. Great tablescape and fabulous back yard. It makes me want to put a deck in our backyard. It looks so relaxing. Thanks for sharing. What a lovely outdoors setting. Your deck looks so nice and your table is so soothing! Love the soft green colors! What a lovely deck tablescape! Love all the greens. OH MY...your deck is wonderful. So nice and big, no problem with several tables. It's the wind that causes problems with candles, yes, even the dripless ones. Sorry the weather was not cooperating but I bet everyone had a great time! An afghan in July? How lucky you were! Very pretty, I especially love your lantern in the background. I'm SO jealous that it was actually cold there! Hi Lori, I love your setting and your wonderful table. It all looks soooo completely inviting! Wow, when's dinner? Love how well those DRIPLESS work... LOL! Lovely deck and table!! I can't believe someone needed an afghan for warmth somewhere! We're dying in the heat here in Texas! You've set a lovely serene table here in a most scenic setting. What a great place to entertain your friends. The table is lovely. Send some of that cool air down our way! Happy TT! You sure did a great job on your deck. This looks so pretty Lucy. I had that same dining set in Canada,and it lasted forever and was so comfortable. You have it all done so nicely with the pitcher of flowers. What a nice outdoor setting! I agree about the towels, much better than napkins! Very soft and pretty! I hope the weather cooperated! The freshness of the colors and the simplicity of the setting really appeal to me. Great photo of your "dripless" candles! Your witty comments alone are well worth the price of admission! Looking forward to seeing your before-and-after pictures of staining your decks. A very fresh and elegant look.Thanks for sharing.